For months, the world has been witness to the ascendancy of Xi Jinping. He’s the president of China, general secretary of the Communist Party, head of the Politburo and head of the Chinese military. Recent party congresses have gone even further and enshrined Xi’s writings on a par with Mao Zedong and removed term limits for the president of China. This means that Xi is not limited to the traditional two five-year terms but is now a de facto president for life. Xi has cracked down on his enemies and has imprisoned many and sent others to reeducation camps for political indoctrination. The unlucky ones have simply disappeared and some are believed dead. With this much power, it appears from the outside that Xi is firmly in control of the world’s second-largest economy and the world’s largest population. The problem with this much power is that you have nowhere to go but down. Dissatisfaction is growing in China with slower growth, more bad debts, higher inflation, a declining currency and strict capital controls. Now Xi is caught in the crosshairs of a trade war with Donald Trump that China is certain to lose. Xi’s political enemies are becoming more outspoken and U.S. companies such as Google are being embarrassed by revelations that they are working with the Chinese Communist regime to single out dissenters so they can be arrested, tortured or killed. This article takes a deep dive on these negative trends for China and Xi. For now, Xi still has the situation under control. 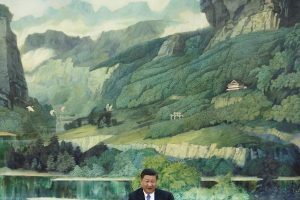 But cracks are appearing in the façade of stability and it may not be long before Xi loses what the Chinese call the “Mandate of Heaven” for the legitimacy of his regime.